Trailhead and parking area are located on Nash Stream Road in Stratford, NH. Take Emmerson Road from Rt. 110 in Groveton, 2.6 miles east of Rt. 3. In 1.4 miles, bear right onto Northside Road. Continue 0.7 miles and turn left onto Nash Stream Road. Nash Stream Road is not signed; it is across from a cemetery at a turn in the road. The small parking area is 8.3 miles down the road, just after a bridge. It is on the left. You will see the Cohos Trail symbol (a mountain with the letters 'CT') on a wooden post. You will also see a camp cabin behind the parking area. From the parking area, walk down the Cohos Trail 0.1 miles to a signed fork. Bear right onto the Sugarloaf Mountain Trail (The Cohos Trail/Sugarloaf Arm Trail goes left). Continue straight in 0.3 miles where the snowmobile trail leaves on the left, then climb 1.7 miles to the summit. 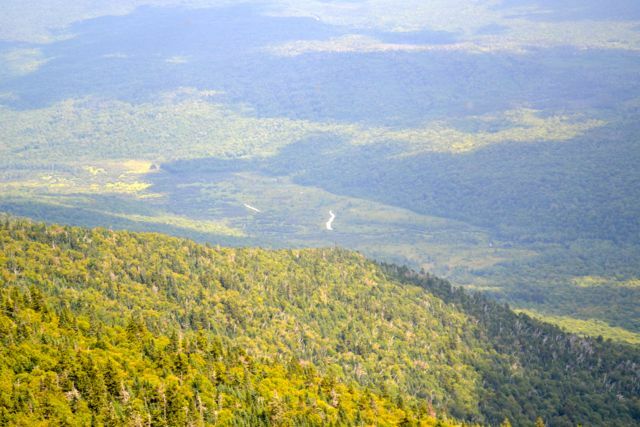 Deep in Nash Stream Forest lies the mountain officially named only "Sugarloaf", one of the more unknown hiking destinations north of the White Mountains. It once was the location of a fire lookout. It is located in a group of the tallest mountains in the region, giving its ledgy summit a good perspective of Nash Stream Forest and into the distance in many directions. Hikers on its summit feel isolated and far removed from the busy trails of the White Mountains, seen far to the south. The trail starts nine miles down the dirt Nash Stream Road, on a link of the 165-mile Cohos Trail. From the parking area, walk down the combined Cohos Trail and snowmobile trail 0.1 miles to a signed fork. Bear right onto the Sugarloaf Mountain Trail (The Cohos Trail/Sugarloaf Arm Trail goes left). The trail continues to follow the snowmobile trail uphill at a moderate grade for the next 0.3 miles along a brook, passing one small cascade. The snowmobile trail then forks off to the left and the trail follows an old jeep road which was once used to access the watchman's cabin. Now the trail steepens. It follows this jeep road for the most of the ascent. Although few sections are particularly steep or rough, the grade remains constant throughout the entire climb, which makes it very tiring. After 1.2 miles of relentless climbing, the trail enters an overgrown clearing. In the middle of this clearing, on the right side of the trail, are the remains of the fire watchman's cabin, including cement blocks, metal roofing, and a sink. The trail returns to the woods at the top of the field, where there is a small view, and resumes the strenuous climb. Eventually, the trail reaches a short flat place, the only such place to be found on the trail. The trail then ascends more gradually near the top. Half a mile from the clearing, the trail climbs the last pitch to the summit ledges. The view from the rocky summit over the vast wilderness is stunning. To the northeast, it looks out over the valley which holds Nash Bog (a former man-made lake) and to Dixville Peak. To the northeast are the two peaks of long Whitcomb Mountain. To the east are the distant northern Mahoosucs, including Maine 4000-footer Old Speck Mountain. To the southeast is nearby Long Mountain, with the smaller Percy Peaks below. Behind the Percy Peaks, to the southeast, is the Kilkenny Range, including Mts. Cabot and Waumbek. To the south and southwest, the view extends for a long distance into the White Mountains. To the west are the nearby Goback and Savage Mountains. From the west to northwest, the view is blocked by trees. To the north, through the trees, are many nearby mountains, including higher Blue Mountain, the tallest mountain north of the Whites.